The CALLAS Shelf : a library of multimodal components developed and made available from the Consortium partners , starting from state-of-the-art technologies, improved and transformed into exploitable components. 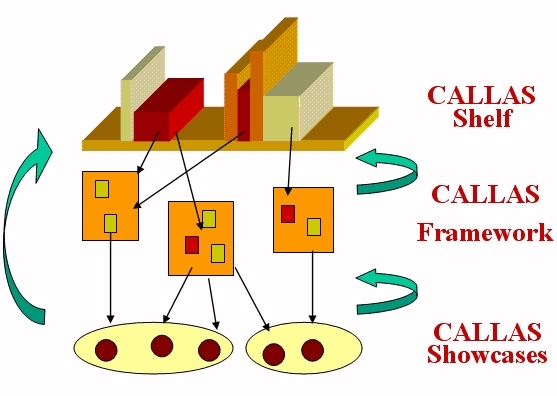 The CALLAS Framework : a plug-in architecture for the interoperability between the components, allowing multimodal applications developers to combine them at design time, providing significant cost reduction as well as quality of software improvement. The CALLAS Showcase : experimental applications using the CALLAS Framework to demonstrate how successful the technology is in conveying affectiveness and augmenting the people experience in different interactive spaces. Each layer represents an iterative phase of R&D: new basic components made available for the Shelf might affect the conceptual Framework and viceversa, whilst the evaluation process of the Showcases affects both the Framework and Shelf through its continuously gathering of feedbacks from the users and eliciting of requirements.